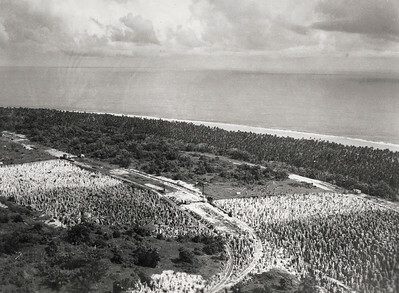 Worked-out phosphate fields leaving coral pinnacles, c. 1941. State Library of Queensland, Box 15676. 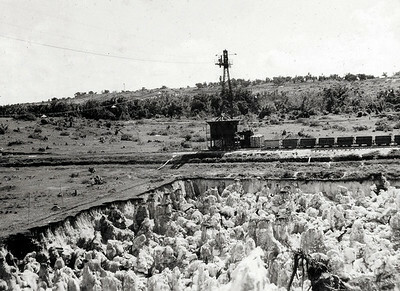 Phosphate field in process of working, c. 1941. State Library of Queensland, 27224 Nauru Island Photograph Album. 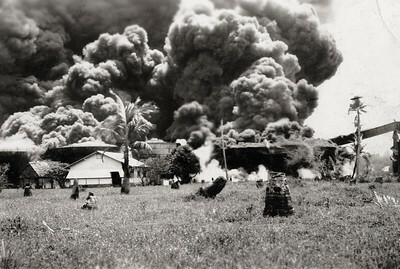 Smoke from burning oil tanks of the British Phosphate Commission, shelled by a German raider, the Komet, December 1940. 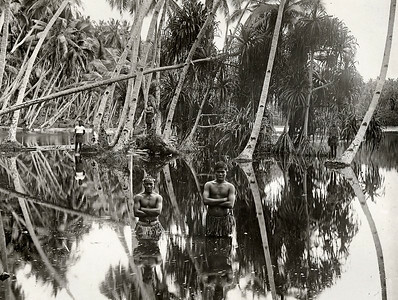 State Library of Queensland, 27224 Nauru Island Photograph Album. 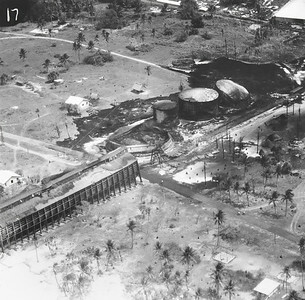 Aftermath of the burning of the oil tanks, Nauru, December 1940. State Library of Queensland. 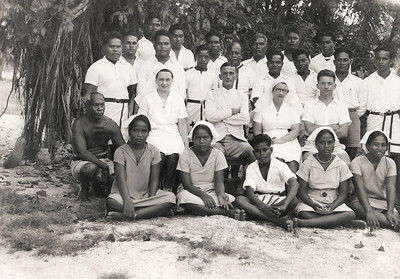 Dr. Quin with hospital workers on Nauru, c 1941. State Library of Queensland, 27224 Nauru Island Photograph Album. 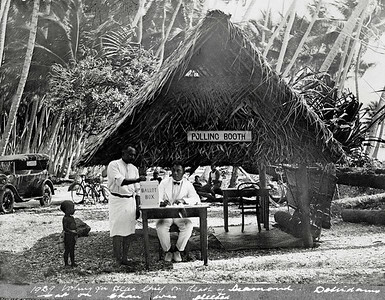 Polling day on Nauru. 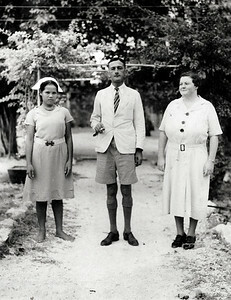 This image comes from a photograph album of Thomas Cude, Chief of Police on Nauru from 1927 to 1954. State Library of New South Wales PXE 650. 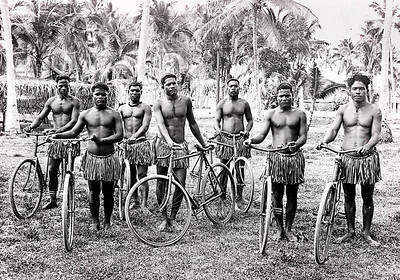 Nauruan chiefs with bicycles, c. 1920. State Library of New South Wales. 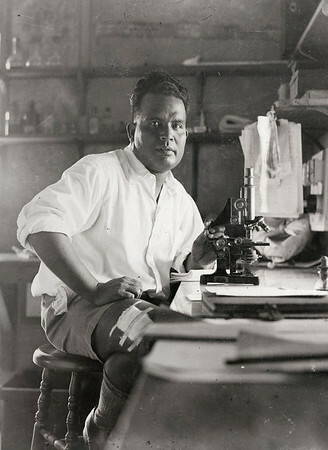 Nauruan doctor, c. 1941. State Library of Queensland, 27224 Nauru Island Photograph Album. A very significant place in the life of Nauru. State Library of New South Wales PXB 293. Many of the Nauruans in this image would soon be deported by the Japanese to harsh exile on Truk island, nearly 2,000 kilometres away. The two European men, Dr. Bernard Quin and Bill Shugg, medical assistant, were among the five Australians who elected to stay on Nauru during the occupation. They were interned in a house near the hospital. After the first raid on the airstrip by US bombers in March 1943, all five Australians were executed by the Japanese. State Library of Queensland, 27224 Nauru Island Photograph Album.